Liang Wenchong is a Chinese professional golfer. 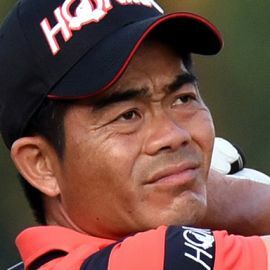 He was the highest ranked golfer from the People's Republic of China and the first Chinese golfer to have reached the top 100 of the Official World Golf Ranking. He succeeded his mentor Zhang Lian-wei as the top Chinese player. Liang plays on the Asian Tour, Japan Golf Tour and OneAsia Tour. He finished 21st on the 2006 Japan Golf Tour money list, after finishing second at the Fujisankei Classic. In 2008 he was second at the Japan PGA Championship. At the Asia-Pacific Panasonic Open he finished third in 2008 and second in 2009. In 2014 he finished second at the KBC Augusta. After more than a dozen top-10 finishes on the Asian Tour, he won the 2007 Clariden Leu Singapore Masters, which was co-sanctioned by the Asian Tour and the European Tour. He was the second golfer from the People's Republic of China to win on the European Tour after Zhang Lianwei. In 2007, Liang won the Order of Merit on the Asian Tour, becoming the first from mainland China to do so. In 2009 he finished second at the Barclays Singapore Open, a European Tour event. On the 2013 European Tour, he finished third at the Lyoness Open and Avantha Masters. In August 2007 he became the first golfer from the People's Republic of China to play in the PGA Championship. He ended up missing the cut. He also received a special invitation to play in the 2008 Masters Tournament. In July 2008, Liang became the first Chinese golfer to make the cut at a major, The Open Championship at the Royal Birkdale Golf Club. In August 2010, Liang set a new course record at Whistling Straits with his 8-under 64 in the third round of the 2010 PGA Championship, where he finished eighth.